After bursting onto the file-sharing scene to wave of publicity, Popcorn Time has settled down to become another established way of obtaining and sharing video content. Often referred to as the Netflix For Pirates, Popcorn Time has seen more than its fair share of controversy, with several forks and developers having been targeted and in some cases shut down by the MPAA. One fork, however, is still going strong. Popcorn-time.to remains one of, if not the most popular variant of the software. Its tagline from the beginning has been “This Popcorn Time service will never be taken down” and thus far it has lived up to that billing. With 2016 drawing to a close, TorrentFreak caught up with its developers to listen to their thoughts and plans for 2017. What we didn’t expect was a broadside against what they refer to as the “US Content Monopolies [USCM],” aka the MPAA. Noting that copyright is a relatively new framework, the team say that fast Internet and digitized media has enabled groups such as the MPAA to “tax end-users” in order to feed their “monstrous appetite.” Content is expensive, they say, and not everyone can afford to buy it. “It’s obvious that watching one’s favorite TV series chapter as soon as it’s released, or buying a VOD, is cool, extremely convenient and fun. But it costs. US$99 (average) monthly in the US and more in Europe. The average monthly salary in the developed countries is between US$10,000 to US$1,200. In third world countries it’s significantly less,” the team says. The team says that while the MPAA fights people who can’t afford to buy tickets or pay for subscriptions, shutting down services like Popcorn Time or even regular torrents won’t solve that particular problem either. Where there’s no money available, no blood will come from stone, they say. The team suggests that they’re providing a service to meet this demand, while at the same time providing a counter-balance to what they feel are the unfair business practices of a copyright-protected monopoly with power in high places. “This brings about the conclusion that it is all about politics and political power and immoral tradeoffs between administrations and huge money interests,” they say. In addition to these tough words and the continued running of their own successful Popcorn Time project, the team are also bringing a valuable new addition to the file-sharing landscape in 2017. 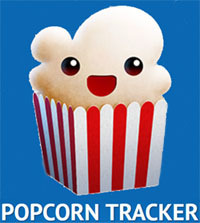 Available now, the team has launched Popcorn Tracker, a brand new OpenTracker-powered public tracker, free to the masses. Public trackers are in pretty short supply at the moment so a new one with capacity will be a welcome addition to the landscape. Of course, the platform itself is content-neutral, so anyone wishing to embed a tracker in a torrent of any kind will be able to do so without restrictions. In closing, the Popcorn Time team see online sharing increasing next year, particularly since the content allowing that to happen is already out there, distributed among the public. “The files containing content are out there, in huge numbers and throughout dispersed locations of sites, being the sites of sharing, P2P users,” they conclude. 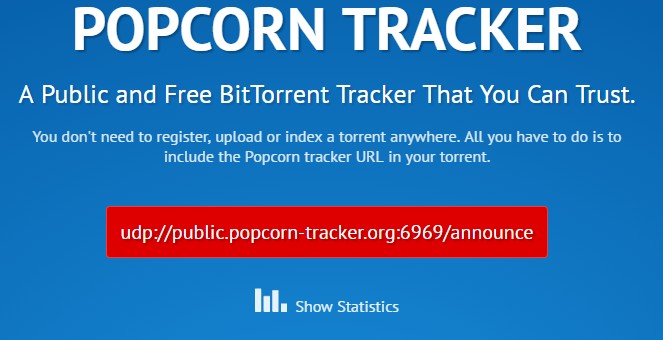 Popcorn Tracker, billed as “A Public and Free BitTorrent Tracker That You Can Trust”, is available here.